K-pop act GOT7 is slated to return with a repackaged version of its latest EP “7 For 7” on Dec. 7, according to the group’s agency JYP Entertainment. 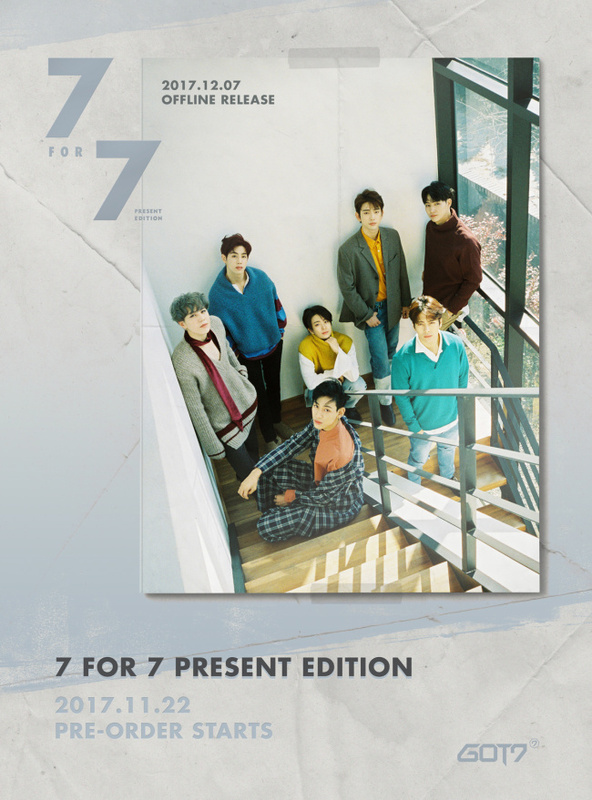 The poster for the upcoming repackaged album titled “7 For 7 Present Edition,” shared by the agency’s official website Tuesday, showed the seven-piece group posing at a stairway surrounded by white walls. “7 For 7 Present Edition” will be available for pre-order from Wednesday, the agency said. Having debuted in 2014 as the agency’s first boy band since 2PM in 2008, GOT7 ventured into Japan in 2014 and dropped its debut Japanese-language single “Around the World” the same year. After years of promotional activities in both Korea and Japan, GOT7 most recently released its seventh EP “7 For 7” in October, following the completion of its yearlong “Flight Log” trilogy in March last year. The seven-track EP “7 For 7,” fronted by lead track “You Are,” topped iTunes Album Chart in 17 countries around the world.